Here is a quick menswear roundup. 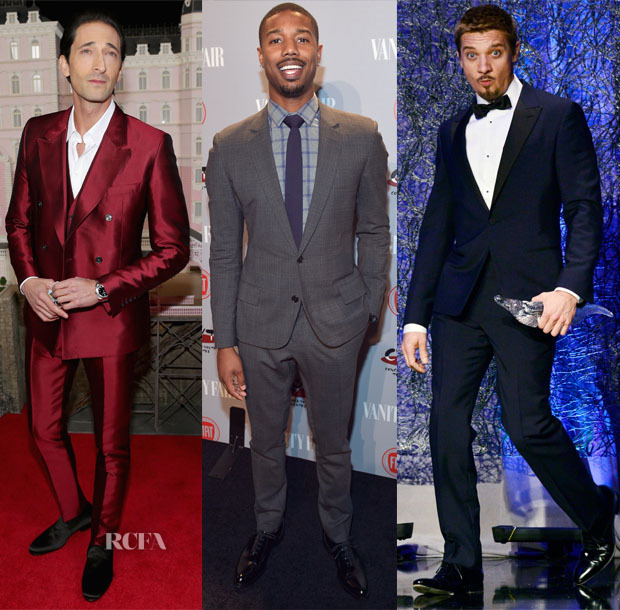 Adrien Brody: Joining Saoirse Ronan on the red carpet for’The Grand Budapest Hotel’ New York premiere on Wednesday (February 26), Adrien made quite a splash on the red carpet wearing a shiny Dolce & Gabbana three-piece red suit with an open white shirt and black shoes. It’s not often we see men don this colour on the red carpet, but if one man can pull off a shiny red suit, it’s Adrien Brody. Michael B. Jordan: The actor attended the Vanity Fair and FIAT Celebration of ‘Young Hollywood’ on Tuesday (February 25) wearing a perfectly fitted Dior Homme two-button notch-lapel Prince of Wales check suit, a grey-and-blue windowpane-plaid check shirt and a navy-blue-and-burgundy pinstripe wool tie. All the elements work, blending together to create yet another BDOTW-worthy look. Jeremy Renner: On Saturday (February 22) Jeremy attended the Costume Designer Guild Awards, where the actor wore an Ermenegildo Zegna Couture classic tuxedo while presenting an award to Amy Adams. There’s nothing quirky about this outfit, and that’s okay. Opting for a classic tux is sometimes the best way to go.